There are many " Cycling holidays Spain " offers out there on the internet. 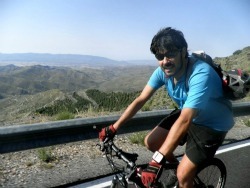 However, rest assured that Ricardo Aparicio, founder of RUTAS POR ALMERIA will surprise you, taking you from the Sea to the Sky, from Volcanic areas through the Desert to snowy mountain pieks. What ever route you prefer, just ask him to design a special and individual one for you! I’m a lawyer that one day decided to leave everything and put all my energy and effort on what I really liked: the bicycle.I developed a passionated interest in “the two wheels”. And I developed that passion as a physical challenge and as a discover of landscapes and spots.That is what I want to suggest here, taking advantage of the physical challenge to discover different environments, visiting places, admiring landscapes. Riding a bicycle will be no longer only pedalling up to the finish. RUTAS POR ALMERIA is a Company of active tourism focused on the organization of great adventures, both by bicycle and on foot. 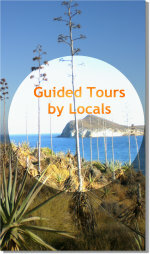 We offer routes around the whole geography of Almería at different physical levels and with different span of time. We give you individually designed quotations of cycling holidays Spain routes in Almeria without any obligation. We can design routes as you like, adapted to your physical level, for your holidays, as long as you want, and in several languages. And if you what you want is going on your own or having a ride, we have a bicycle rent service. We will enjoy an unique tour that will take us from the calm beaches of the Mediterranean sea to the high peaks of Sierra Nevada, through Sierra de Gádor, Andarax Valley, Alpujarra and the peaks of Mulhacén and Veleta. We will leave behind us Sierra de Gádor and we will be gaining height by the Andarax River till we arrive at Laujar de Andarax, capital of Almería´s Alpujarra. After leaving this town, we will go deep in Sierra Nevada, by the oriental side of the massif, full of lush forests, irrigation ditches, crops and precipices until we get to Puerto de la Ragua. We will travel across the massif of Sierra Nevada, from its eastern side to the base of Mulhacén in Trevélez, the highest town in the Alpujarra. The stage goes by a forest road skirting the mountain at an average height of 1900 meters, and we will find beds, cascades or cliffs by the hundred. You will not be able to do anything but to admire all the beauty you will come across in every single meter of the stage. Stage 4: 80 kilometers (slope: 2100 meters)The last stage of the tour, and no doubt the most astonishing one. We will climb to the Veleta and then we will do a vertiginous descent to Granada, as an incredible way to round the route off. Technical assistance in every stage. Bed and breakfast for 3 nights. Transfer to the train back to Almería. Groups over five people: 15% off. On this cycling holidays Spain tour we will give you the clues to unravel the mysteries hidden in the rare beauty of Almería countryside. You will be able to enjoy the tranquility of all its spots, painted by Nature in a thousand different colours. Don´t miss this wonderful scenery, this real open-air museum !! We will leave Almería to get to the heart of the National Park Cabo de Gata-Níjar , where we will visit the lighthouse at Cabo de Gata both with its beautiful creeks, the town of San José, the defensive fortress of San Felipe... Then we will spend the night at Los Escullos. We will leave the National Park Cabo de Gata-Níjar going in wonder at the volcanic scenery of the mountains and then we will go deep in Sierra Alhamilla, an oasis in the middle of the desert. Afterwards the first ramps of the tour, we will arrive at Tabernas, where the desert reaches its most radiant beauty. The high mountain starts !! We will go up the Alto de Velefique (also known as the Spanish Alpe d´Huez due to its countless curves) and the rough Calar Alto, in whose peak cyclist as Roberto Heras and Igor Antón have won a stage of the Spanish Cyclist Tour. We will spend the night in the pretty Moorish town of Bacares. The longest stage of this cycling tour. We will go up Puerto Padilla, another 2000, that has been included for the first time in this year´s Spanish Cyclist Tour. We will know Sierra de Baza and after a long downhill, we will go deep into the region of Nacimiento, spending the night at Fiñana. Stage 5: 83 kilometers (slope: 1430 meters)We will arrive at massif of Sierra Nevada through the north slope and climbing the Puerto de la Ragua, other mythical mountain pass of the Spanish Cyclist Tour. There we will enjoy amazing sights from the top and then, in a fast downhill, we will finish al Laujar de Andarax, in the heart of Almería´s Alpujarra. After a winding and tough beginning, we will leave behind the Andarax valley and Sierra Nevada to go deep in the last mountain challenge, the Alto de Enix in the Sierra de Gádor, a beautiful ascent with sights to the Mediterranean Sea as a culmination of a breathtaking tour. Bed and breakfast for 5 nights.